TrackDay Pro | FTLapps, Inc.
– 241 track configurations around the world and counting! Don’t see the track you’re looking for, tell us and we’ll add it! Join our team! Download TrackDay Pro on the App Store today! Follow us and provide feedback via Facebook at www.facebook.com/TrackDayPro, or email us at trackday@ftlapps.com to let us know what tracks you’d like to see! Several trackday companies on the west coast have gone to a A/B/C group model where at the top of the hour for 20 minutes is group A, 20-40 is group B and 40-0 is group C – any interest in adding a feature to your app that would have a time – showing the group that’s on the track? Also, I was trying to see of you have a built in map for Streets of Willow (at Willow Springs) or, how difficult is it for me to build a map? Thanks for the heads-up. Cool idea! We’ll add it to our backlog. Sorry we overlooked Streets of Willow! We can totally get it into the TrackDay Pro version tonight. If you do try out the Track Editor, let us know what you think! I want to buy this product but I want to informe if you have the serres circuit map in Greece. Serres Racing Circuit is now available in TrackDay Pro! Miller motorsports park has 4 different track configurations (east, west, perimeter, and full. Does this app support them all? If not, which does it support? We created the Miller Motorsports Park raceline (for the full configuration) with the 1.0 version of TrackDay Pro — when specification of both the raceline *and* speeds at every point was a completely manual process. Now, we can lay out the raceline in 20-30 minutes for most tracks while tuning the “max speed” throughout the process with a single touch. Once the raceline is clean, setting the speed for the entire circuit takes one touch; milliseconds rather than hours. We’ll get the other three configurations added shortly! Follow us at http://www.facebook.com/TrackDayPro for the latest updates! We now have all four track configurations available in the TrackDay apps. Details at http://www.facebook.com/TrackDayPro! We just used the Pro Version yesterday at Miller Motorsports park outer loop. We used it in a car, I had my iPhone on my lap as a passenger, but the line we drove was not on the track on the app. It was through the infield and then off the track to the outside. We use AT&T and had a 4G strong signal. Any ideas. Unfortunately, the 4G signal strength is not an indicator of GPS signal strength. Discussions of the 4G WiMax signal suggest a maximum range of 20-30 miles; given those figures, within anything less than 5-10 miles from the tower, your signal strength would be quite high. The GPS satellite constellation, on the other hand, operates at an orbital distance of over 16,000 miles and outputs a relatively low power signal. Because of this, the quality of the signal is rapidly degraded by obstructions — your iPhone will obtain the highest quality GPS signal with line-of-sight to multiple satellites. Will you or have you thought of doing Broadford raceway in Victoria, Australia? It’s on our list now! Follow us at http://www.facebook.com/TrackDayPro or on Twitter at @TrackDayPro for the update when it’s added! 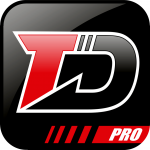 Interested in using this a track days this year and bought the Pro app. I want to use the iPhone to capture the data with a dual GPS receiver mounted to bike so I can keep iphone in pocket. Is this a viable option? The dual GPS receiver is more accurate than the on board GPS antenna on the iPhone. Next question: Is there a way to capture the data using a iPhone on the track and then be able to review on iPad for the bigger screen? I would prefer to not try and mount the iPad due to size, but reviewing data on the bigger screen would be great. Thanks for your purchase Dave! Welcome to the TrackDay team! Follow us at http://www.facebook.com/TrackDayPro for regular updates on new tracks, upcoming versions, test results, etc. We have researched a number of third-party GPS receivers, and they look promising. In theory, they should augment the iOS GPS services and provide exactly the improvement you’d expect (i.e., faster sample rate, improved accuracy). But, to date, we have done *no* testing with third-party GPS devices. If there’s a particular model you plan to use, let us know and we’ll investigate further. We’ve updated the http://www.ftlapps.com/wordpress/2012/09/trackday-gps-accuracy/ page with some great tips from our extended team re: mounting the iPad in a car. But, on a bike, no way — the iPad will act as an airfoil in just about any position you try to mount it; even the tail of your bike — I’d be shocked if you can pass tech inspection. And, because of its increased size, if you have a crash, your iPad will almost certainly be destroyed. The iPhone is the only way to go for motorcyclists out on the track. I’ve just purchased trackDay for iphone and sonoma raceway track to use for upcoming track day there. The configuration you have for Sonoma raceway is the car configuration which is different than the bike one. What will happen if I use it as is? Is there a way to change the track to show the bike line? The TrackDay 3.0 Dashboard depends on the raceline to compute the distance of the track, sectors and sector times — but the session data collected by the app is independent of the track itself, so it should work just fine. After your session is complete, you can move the pit-in, pit-out and start/finish features and adjust their sizes for best intersection with your GPS traces. If you can point us to a reference that shows the specific configuration you’re looking for, we make it available in the app within a day or so. We have the “Track as used by most series” configuration from http://en.wikipedia.org/wiki/Sonoma_Raceway and will add the NASCAR configuration. We’ll also add the AMA / IRL configuration, although the variations from the current track are insignificant from the app’s perspective — less than the typical +/-10m GPS error. Let us know if you’d like to see any other variation! Listed motorcycle configuration for Sonoma Raceway is listed “counter clockwise” but this is not right. The motorcycle configuration is still clockwise and is even listed the Wikipedia page you linked. 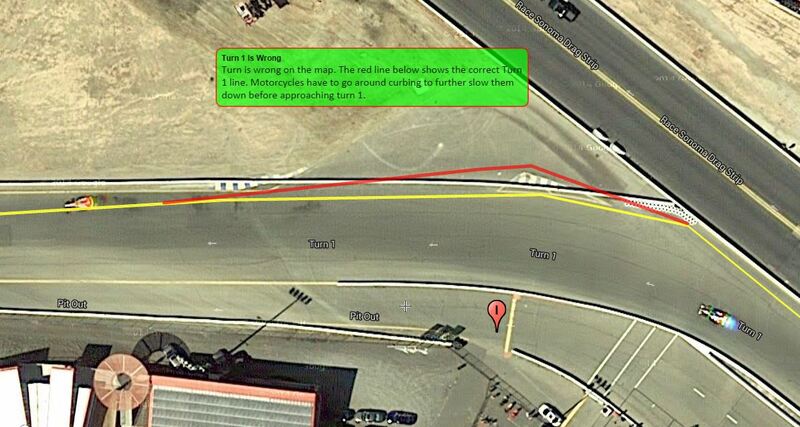 This is the standard AFM configuration for this track and the one used by all motorcycle track day organizations. Thanks for the heads-up! Sonoma was among of the first few tracks we added to the TrackDay apps. If you want the clockwise configuration, just download “Sonoma Raceway.” We’ve removed the “Motorcycle Configuration” portion of the name from the counter-clockwise configuration. just grabbed your app along with sydney motorsports park eastern creek, just wondering if will you be adding the brabham circuit as that is the circuit used for ride days. Hello, fantastic app! Could you please add “L’Anneau du Rhin”, France, for me? Thanks Tom! Absolutely! On our list! Is there any plan to put Mondello Park, Ireland onto this. It looks a great app. Thanks! There’s a plan now! We’ll update here and on our @TrackDayPro facebook page as soon as it’s ready! You’re very welcome! Thanks for your interest / support! Has anyone recorded Oregon Raceway Park? I’m going to be there for the first time next month and would like to study the track. How do I open the .track file that I’ve just exported? Track and Session exports are designed to enable you to share the data among your devices (e.g., iPhone to iPad) for further analysis. Also, if you create a new track, you can send it to us to share with the world. And, if you share your sessions with us, we can help diagnose any issues you encounter, or just share with the rest of the TrackDay team on https://www.facebook.com/TrackDayPro. Can you load more than one car on Track day pro, ie if you are using more than one car on a track day? Right now, each app tracks just one vehicle. However, if you purchase the TrackDay Pro Bundle, that’d allow you to use TrackDay Pro for one vehicle, and TrackDay for iPhone for another. Adding support for multiple vehicles (within a single app) is on our backlog — a few notches higher, now. I want to know before I buy the app, are gingerman and grattan raceways you have already on your app the ones in west Michigan? If not they are smaller club circuits so could you go in an add them? We’re running a bit slowly these days, but we are still taking requests! If you have specific tracks you’d like added, let us know. As long as the satellite imagery is good, we can get them added within a day or so. Could you add the circuit de bresse in france? Thanks for your request! Circuit de Bresse is on our list now. We’ll get it added within the next day or two! Absolutely! Thanks for your request. We’ll have the track added within the next day or so! Awesome app! I bought a while back but finally able to test it at Buttonwillow on my bike. I simply started the session from the pit, stored my iPhone in my suit pocket and headed out. The app knew when start and stop the timer. I paired my phone to my Dual GPS and the results where amazing. I had to design a special mount for the GPS to mount on the tail of my motorbike. Now I have some data but would like to compare with faster riders. Is there a forum where users are posting lap data publicly? Fantastic question! This concept has been on our backlog for a while — and now, with iCloud, we can easily host data that is only available to you privately or can also be shared publicly!